Craig Glover-Hines '09 has been recognized by Bishop McNamara High School not only for his services as a member of our faculty, but also for his commitment to faith and the moral character he exudes, serving as a source of inspiration to his students, colleagues and friends alike. While others have spent the summer sleeping in, Dylan Wort '20 has been busy working at the P. A. Bowen Farmstead in southern Prince George's County where the farm to table movement is an essential part of each day. 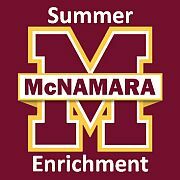 You are cordially invited to attend the Bishop McNamara's 18th Annual Mother-Son Brunch on Sunday, May 5, 2019 at 11:00 am in the Andy Mona Student Center at Bishop McNamara High School. Ainsley Spain '22 honored for her performance at the 2019 Maryland State NASP® (National Archery in the Schools Program) Bullseye Championship and 3-D Challenge.